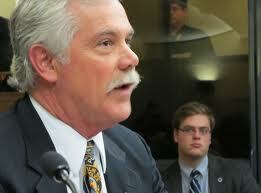 Rep. Tony Cornish ditches the NRA shirt for his lawmaker wardrobe. I don’t claim to be an expert on guns. And this blog is about books and writing, not politics. Still, I have a tiny bit of credibility because I wrote three books about weapons for kids. See? It relates to the blog! Last week, a state representative in Minnesota government wanted to make a point about the gun-control debate. Rep. Tony Cornish posted on Facebook a photo of himself, wearing an NRA shirt and holding an AR-15. Behind him is a coyote hanging from a tree. He shot the coyote from 225 yards. From Wikipedia: The AR-15 is a lightweight, 5.56 mm, magazine-fed, semi-automatic rifle, with a rotating-lock bolt, actuated by direct impingement gas operation or long/short stroke piston operation. Gun control advocates say the AR-15 isn’t for hunting. For the record, I’m not a hunter, but I support them. Hunting is part of our culture in the Midwest, and I’d rather see deer, for example, killed and used for food than starving in the winter because of overpopulation. Back to the photo. The Mankato Free Press printed the photo with a story on gun control. Cornish thinks killing an animal with an AR-15 proves his point: The AR-15 should be considered is a hunting tool, not just a gun for shooting rampages in schools and movie theaters. Therefore, the government should not restrict this weapon or others like it. Hmm. I could kill a coyote with a nuclear bomb. But that doesn’t mean I should. Back to the book blog. To see my kids books about weapons and war, look under the “My Books” tab. This entry was posted in Media Coverage, Nonfiction, Politics, Uncategorized and tagged and Gear of the Iraq War, and Gear of the Vietnam War, AR-15, Mankato Free Press, National Rifle Association, the Science of Weapons, Tony Cornish, Uniforms, Weapons on February 4, 2013 by Shelley Tougas.